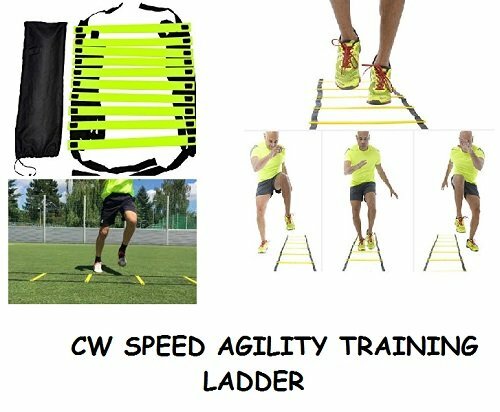 "CW ""Speed Agility Ladder "" crafted and made from high quality durable material . Its 8 Meter long with 18 strengthening crosspiece adjustable rungs . Ideal for all sports players . Light - weight , adjustable material made easy to carry with its bag . Ladder can use for outdoor and indoor practice . Ladder mainly used by football ,soccer , volleyball and all other sports player to build their feet more strengthener . Ladder help you to gain more speed for your foots.It Improves Foot Speed, Agility, Coordination and Overall Quickness.It Improves Foot Speed, Agility, Coordination and Overall Quickness. Spread it on the Ground and Fold It over for Your Jumps and Extend the Jumps as You Progress. Flat Rungs for More Safety and Adjustable To Suit Individual Needs and Preferences. Package Includes 1 Exercise 8 Meter Ladder with 18 Flat Rungs in a Carry Bag with Handle. Colors and Design May Vary. " CW Speed Agility Training Ladder made from high quality durable material . Best quality product by Cricket World . Ladder 8 Meter long with 18 Adjustable rung distance along with durable nylon straps.Stable & Safe - Made from study PP material, the heavy-duty plastic rungs won't move easily and the individual rungs can be moved and changed for special needs. Quick Setup - Simply unravel the straps and rungs to set up on surfaces for use. Carrying a bag to keep it organized.